THEME: You must select at least one of the world elements (Earth, Air, Fire, Water) and make a FULL PERMISSION item reflecting that element. This item must be original and created by you.. Thank you for your interest in the Sour Pickles Hunt "World Elements Hunt". 1) All prizes in this hunt must be something original and not a freebie, past gift item, currently sold in your store or in any form of group boards (slap-n-dash, MM boards, ect). 2) All prizes will be BOXED in a box you will make yourself, and these boxes will include the prize and the lm to the next location. 3) If you know someone who would like to join the hunt please send them this note card. 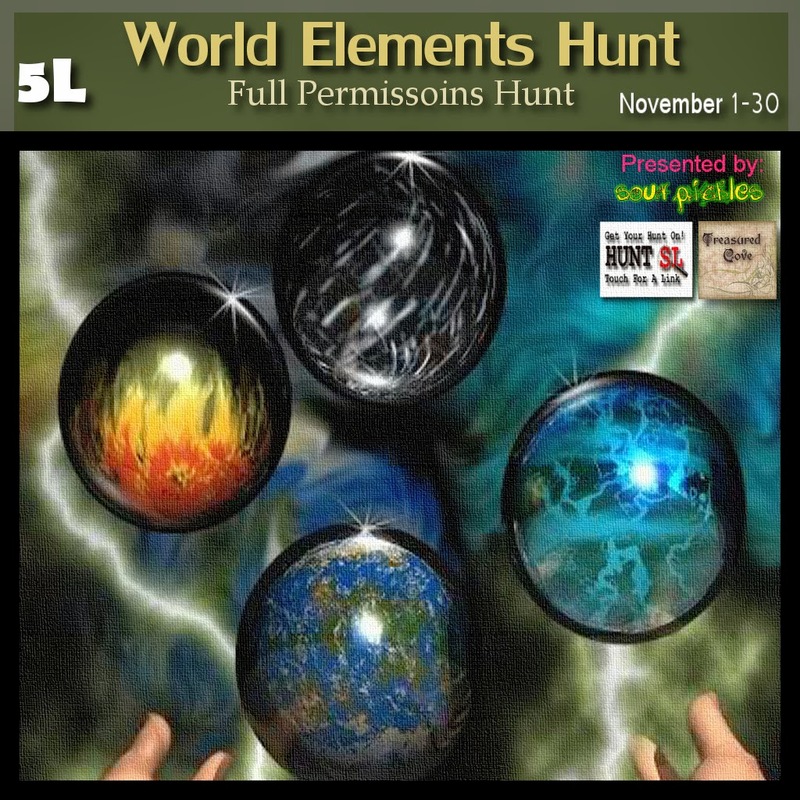 4) The THEME: You must select at least one of the world elements (Earth, Air, Fire, Water) and make a FULL PERMISSION item reflecting that element. This item must be original and created by you..
5) As always you MUST rename your item AFTER ALL WALKTHROUGHS HAVE FINISHED. 6) You MUST move your item 2 TIMES A MONTHS and submit a new hunt (if it changes) when this happens. As a vendor it is YOUR responsibility to keep an eye on the timelines presented in the NC. When you are also emitted into a hunt it is also important to join the Sour Pickles Hunt group to stay updated and to ensure that you have acquired the correct and updated materials for the hunt.